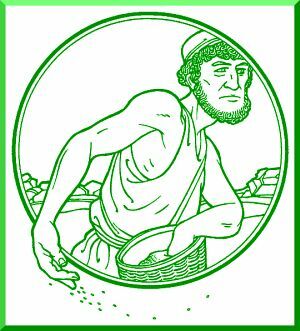 Sermon Theme: Good Earth or Bad Dirt? Summary: At times, Holy Scripture calls us to be active; at others, it renders us passive. So in Jesus’ Parable of the Sower, we discover that we are plots of land. Are we arable, capable of supporting growth? Or are we hard, rocky, or weed infested? By nature, nothing truly good grows in the soil of our souls. The gift of forgiveness lands on us but cannot penetrate our sinful, fallen pride. God must prepared us, tearing us open with the plow of His Law, blasting the rocks to rubble, and clearing the weeds. Only then can what He plants have hope of growing to ripeness. Too often, we forget the true and full message of this parable. We jump to the end and start wondering just how much we can produce. We fail to remember that the growth is caused by God and only He can bring any increase. We have no cause for pride in the fruits we produce, only thanksgiving that anything at all worthwhile could grow and thrive in the good earth prepared by the Sower, Jesus Christ. Text: That same day Jesus went out of the house and sat beside the sea. And great crowds gathered about him, so that he got into a boat and sat down. And the whole crowd stood on the beach. And he told them many things in parables, saying: “A sower went out to sow. And as he sowed, some seeds fell along the path, and the birds came and devoured them. Other seeds fell on rocky ground, where they did not have much soil, and immediately they sprang up, since they had no depth of soil, but when the sun rose they were scorched. And since they had no root, they withered away. Other seeds fell among thorns, and the thorns grew up and choked them. Other seeds fell on good soil and produced grain, some a hundredfold, some sixty, some thirty. He who has ears, let him hear. Audio: Click to hear MP3 of Good Earth or Bad Dirt?, preached to the saints of Lutheran Church of Our Redeemer, Marshall, Missouri.